Johannes Vermeer (1632–1675), Girl with a Pearl Earring, ca. 1665. Oil on canvas, 17 1/2 x 15 3/8 in. (44.5 x 39 cm) Royal Picture Gallery Mauritshuis, The Hague. Bequest of Arnoldus des Tombe, 1903. We have all had the experience of going to an exhibition and having one painting stand out so completely in your mind, that you remember little, if anything else, about what you have seen. Such was the case for me with Vermeer’s Girl with a Pearl Earring in the Mauritshuis exhibition at the Frick Collection this winter. I remember feeling happy to see Fabritius’ marvelous little Goldfinch, and making note of some beautiful Rembrandts, large and small, but all I really had eyes for was Vermeer’s enigmatic young woman. I had seen her before several times in the flesh, but I became obsessed with her all over again. And the Frick anticipated and colluded in this obsession by putting her in her own room, genteelly protected by the only velvet rope in the exhibition. And in putting her first, and accentuating her by being solitary, the Frick made sure that the rest of the show could be nothing but anti-climactic. What is it about her? There are a number of things we do know. 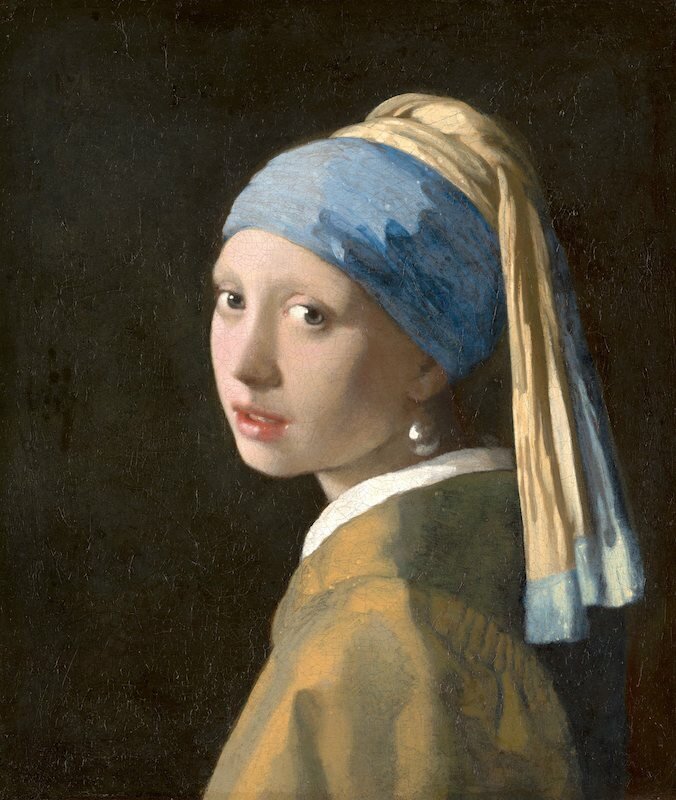 We know that the velvety black of the background—the only such background in Vermeer’s oeuvre—sets off her milky skin like a star in the unknowing night sky. We know that the formatting is consummate, that the relationship between the figure and the rectangle that composes her is perfect, containing her securely, but at the same time giving her freedom and autonomy. And we know that she is like liquid light; softly melting into the air, yet firmly modeled, substantial in her insubstantiality. But there is also all that we do not know, and what we do not know is as important in this work as what we do. For the image is enshrouded in ineffable mystery. For instance, we do not know who she was, or why she has presented herself to us. Was she Vermeer’s servant, one of his daughters, or a model posing for a tronie? * Two paintings, “Tronies, painted in the Turkish manner,” were listed in the artist’s inventory at his death, and it is likely that this is one of those two paintings. However, the moment seems so private, we feel that he must have known her intimately. Her wide eyes are taking in someone’s presence, but we don’t know whom. The slightly parted, sensuous lips imply that she is about to speak, but we have no idea what she is about to say. She is painted so softly that we do not know where the bridge of her nose ends and her cheek begins. We do not know why she decided to turn around, if she heard a voice, or had a parting word to say. We have clearly caught her attention, but the turn of the head does not even let us know whether she was coming or going. We do not know why she was dressed up in the exotic Eastern turban and gorgeous earring—which, she does not need, for she is herself the jewel. I like to think she is one of Vermeer’s daughters. Anyone who has raised teenage girls knows how much time they can spend in front of the mirror, trying on their mother’s jewelry and clothing, dreaming about the identities they will develop, thinking about who they might become as women. Or poking about their father’s place of business, trying to figure out this strange world of men and their professions, and if your father happened to be a painter, you might try on some of the costumes he had around for models to wear. We do not know if the painting was a commission, or, if so, for whom. One of the greatest assets of Vermeer’s legacy is that we know so little about him. Unlike, say, Picasso, whose every breakfast, lunch, and dinner was recorded for posterity, we have to allow Vermeer to exist in silence and let Vermeer’s work speak for itself. To understand exactly how special this painting is, just compare it to the thousands of other similar heads that were painted at around the same time. Most of them pale by comparison; they look so matter of fact, so much stiffer, so tired of posing. The long hours on the model stand show. But Vermeer gives us an instant, a moment. What is ultimately so satisfying about this painting is that Vermeer locates us in the moment in a way that we all so desperately need. Given our propensity to obsess about the past and worry about the future, we lose the only thing we can ever really have, the present moment, and this is precisely what Vermeer so lovingly restores. And he has defeated death: we marvel at the fact that she has been that young and that beautiful for almost three hundred and fifty years. *Tronies, head studies, were painted by the artist for his/her own use. It became its own valued genre in the Netherlands in the seventeenth century, and it is worth noting that the Art Students League is one of the few contemporary art schools for whom the tronie has been a valued pursuit from the day it opened until today. Originally published January 2014 in LINEA.